Exercise is good for your body. It helps you keep your blood pressure under control, can help you improve your mood, and wards off disease. These Twitter apps focus on helping you increase your physical activity, and track the exercises that you do. Ugomo: This Twitter app helps you log workouts, sharing your workout regimen, and more. 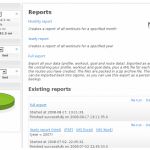 You can look back on your workouts and your success with the help of summaries, charts, graphs and more. TweetaRun: Cool Twitter app lets you tweet how far you run each day. Put in the time and distance, and this Twitter app will figure your other details. Compare your running schedule, and compare it. gtFtr: The Get Fitter with Twitter application helps you record the latest exercises you do, and their stats. Graphs help you keep track of your workouts, and see your progress as you increase the number of reps you do, or miles you travel. TrainingTwits: This Twitter app helps you log workouts, training regimens and more. Share your exercise experiences with your followers, and check your stats. Includes monthly workout minutes for different activities, and helps you plan your workouts. Twittercize: Simple exercises that you can do anywhere — even from your desk. A great resource for exercises that you can do in a minute, adding a little more fitness to your day. Sneak it in here and there, and watch yourself become fitter. Watch what you eat with the help of Twitter. Proper nutrition helps your body stay healthy, can help you feel better and can help you fight cancer and other diseases. These apps can help you really find out what you eat, and see whether it is as healthy as you think it is. Tweet what you Eat: Personal food diary via Twitter. Easy to keep track of when and what you eat. Helps you figure calories for foods you don’t know the count on. Learn your eating habits, and see what you need to change. You might be surprised by the amount of junk food that you eat. 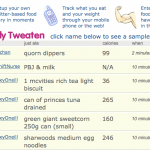 TweetYourEats: Another foot tracker that helps you keep an eye on what you are eating. This Twitter app will then categorize your food, and keep track of your calories. See a total at the end of the day, and watch for eating trends over time. See where you need to cut back, and make a plan for healthier eating. FoodFeed: Tell the world what you are eating, and take responsibility for your nutrition choices. Search to see what others are eating, and compare it to your decisions. A fun way to push yourself to make better food selections. nom.ms: Share your food choices in image form. This cool Twitter app lets you send in photos of what you are heating — healthy or not — and post it up on Twitter. A fun way to motivate yourself to eat better. Wheel of Yum! : This Twitter app is all about figuring out to eat. Wheel of Yum! can help you find something based on your requirements. If you want to eat healthy, this Twitter app can help you find just what to eat. If you are trying to lose weight to help you live a healthier life, and to feel a little bit better about yourself, these Twitter apps can help you set goals and track your progress, helping you stay motivated to keep working on weight loss. 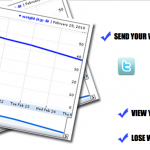 w8track: You can keep track of your weight loss progress with the help of w8track. Use the Twitter version in tandem with the separate Web app. Get summaries that can help you find insights to your habits. Twackit: Even though this app isn’t specifically aimed at weight loss, it can help you keep track of your progress. Use Twackit to keep track of your weight, with the help of the #weight hashtag, and even add notes. Watch your progress using Twitter. Weight loss Charts: Visual representation of your weight loss. Set goals, and then track your progress with the help of this app. Makes charts using your tweets so that you can see exactly how you are doing. Help increase your mental ability and enhance your mood. These Twitter apps can help you learn to find more contentment and connect with yourself. A healthy mind and body are connected, and these Twitter apps can help you keep that balance needed for increased happiness. Inner Twitter: This cool app helps you take a moment to briefly consider your inner state. You can choose to have a chime sent to you at certain intervals, or randomly. When you hear the chime, you are meant to stop, moderate your breathing, and lose yourself for a bit in the moment. TweetBe.at: This organization tool can help you reduce your stress level by helping you organize lists, and even keep track of appointments. Live a more organized life, and be a little happier, with the help of list organization. 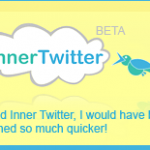 TweetPsych: Learn more about yourself and how your mind works with help from this great Twitter app. You can find out what sort of person you are, and gain a better understanding of yourself with this app. Helpful if you are looking for a little more self-realization. Meditation Twibe: Use this helpful Twitter tool to get helpful suggestions to help you enhance your meditation practice. Connect with others, and learn how to reduce stress and find a little more inner peace with the help of Twitter. The Health Express is your transportation to the exciting world of health and medical information. With stops at Fitness Town, Nutrition City, and Healthville, you can see all the best medical knowledge attractions the web has to offer. © 2019 The Health Express. All Rights Reserved.